Career Mode: FIFA 17 adds depth to your experience with new features that give you even greater control over your club's season, the option to compete in new leagues, and many other key changes. Pre-season Tournaments:Prior to a given season, your club will be invited to three out of a possible nine tournaments, played in Asia, Europe, Latin America, or North America. Just as with real football clubs, these matches will be a great opportunity to work on your team tactics and line-ups to experiment with your entire squad. The prize purse from these tournaments gets allocated to your transfer budget for the upcoming season in Career Mode. Player Training: As the manager in Career Mode, you will be able to train your squad to increase player attributes and boost player development. Each week, select up to five squad players to train from a number of training drills, each focused on developing specific attributes. The aim here is to allow for greater growth in youth squad players and to create more value to the club. Focus on your star players to keep a strong starting XI, develop youth players to increase transfer values and build your funds, or transform your club into the next Ajax or Barcelona, a breeding ground for the future stars of world football. New Leagues: The Japan J1 League is joining the list of leagues in which you'll be able to compete in FIFA 17's Career Mode. Norway and Netherlands International Women's teams have been added for selection in Kick Off and Women's International Cup Mode. 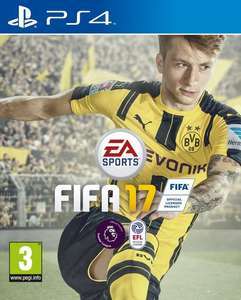 Offline Play a Friend: There are more ways to compete against your friends in FUT 17. For the first time ever, your opponent can download their FUT squad to use in a local offline match. * The couch bragging rights are at stake in FUT 17! Driven Goal Kicks and Throw-ins: Start a quick counter attack by passing it out from goal or the touchline with power and direction. Where can you purchase it at that price? Basically Fifa 19 without player updates, good deal. Run away from that site like plague!